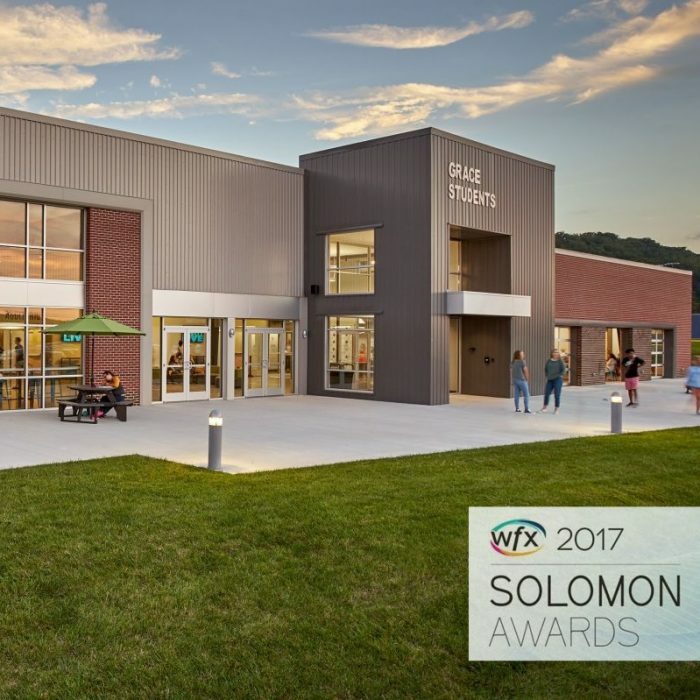 KNOXVILLE, Tenn. – Oct. 24, 2017 – Studio Four Design, a top architecture and design firm based in Knoxville, Tennessee, that specializes in worship facilities, was awarded a 2017 Solomon Award for design by the Worship Facilities Network for their work on the Grace Baptist Church student ministry building in Knoxville. The announcement was made at the WFX Conference & Expo in Dallas, Oct. 11. The award was presented in the category of Church Design – Youth and Children’s Spaces for facilities with 301 to 800 seats. The Grace Baptist Church project was begun in 2016 and completed earlier this year. Grace Baptist leaders wanted the new environment to be relational and fun for the youth of their church. These ideas became key concepts for the design and construction team of Studio Four Design. They needed the new building to complement the transitional style and materials of the existing church campus buildings, but also to be uniquely its own to reflect the brand and identity of Grace Student Ministries. The centerpiece of this facility is a new student auditorium. It provides room for more than 700 students in their mid-week service and is designed for a flexible arrangement of seating. Built at a cost of $3.5 million, Merit Construction was able to deliver this project on time and within the budget constraints of the church while working within a site in the center of an active church and Grace Christian Academy K-12 school, which is also located on the campus. Studio Four Design previously won a Solomon Award in 2016 for their work on the Northstar Church South Knoxville campus expansion. To learn more about other projects that Studio Four Design has been involved in, visit http://studiofourdesign.com. The Worship Facilities Solomon Awards recognizes churches and their partners for excellence in facilities design, building expansion or remodeling, operation excellence, innovative use, and technical production. To learn more, visit http://worshipfacilities.com/article/solomon_awards_winners_for_2017_announced_at_wfx/wfx. Published on October 24, 2017 by Ripley PR. KNOXVILLE, Tenn. – Oct. 17, 2017 – Studio Four Design, a top architecture and design firm based in Knoxville, Tennessee, has been working with the City of Oak Ridge on two new projects to improve the quality of life for its citizens: a preschool facility and a senior center. The Oak Ridge City Council voted Oct. 9 on a resolution authorizing agreements with Studio Four Design to fund and move forward with both projects. The resolution authorized contracts between the City of Oak Ridge and Studio Four Design for architectural, interior design and consulting engineering services for the new preschool building and the new senior center building. The projects are to be supported by more than $1 million in initial bond funding. The Oak Ridge preschool is a 40,000 square foot project in the Scarboro Park area of the community and is budgeted for $10 million. The new $2.9 million, 11,000 square foot senior center will be built near the civic center area of Oak Ridge. Both projects are slated to break ground in May of 2018 with completion dates in 2019. The Oak Ridge preschool and senior center projects have been in development for several years, and city officials are now ready to move forward with the approved designs for both facilities.